We are the fastest growing taxi company in Gateshead with over 150 vehicles and 6 different offices spread throughout the area. All our offices run on a 24hr basis as standard. All of our drivers are fully uniformed, police checked and local authority approved, all our vehicles are under 8 years old, in immaculate condition inside and out, constantly maintained to the highest of standards and fitted with the latest GPS technology. We have the largest mini bus and wheel chair accessible fleet in the North East with our minibuses able to carry up to 16 passengers and our wheel chair vehicles able to carry up to 2 wheelchairs and 8 passengers. We also have long wheel base 8 seater vehicles which have a vast luggage carrying capacity. 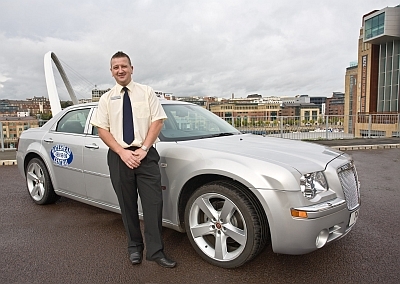 We have an immaculate fleet of private hire and executive cars all of which along with our mini buses and wheelchair vehicles run on the previous Gateshead Central Tariffs making us the cheapest taxi company in Gateshead.